Fu Lu Shou, three strange Chinese fellows staring back at me through the museum glass. Their faces are familiar, I have seen them before on cloth, in porcelain and paint. But who are they and what do they represent? 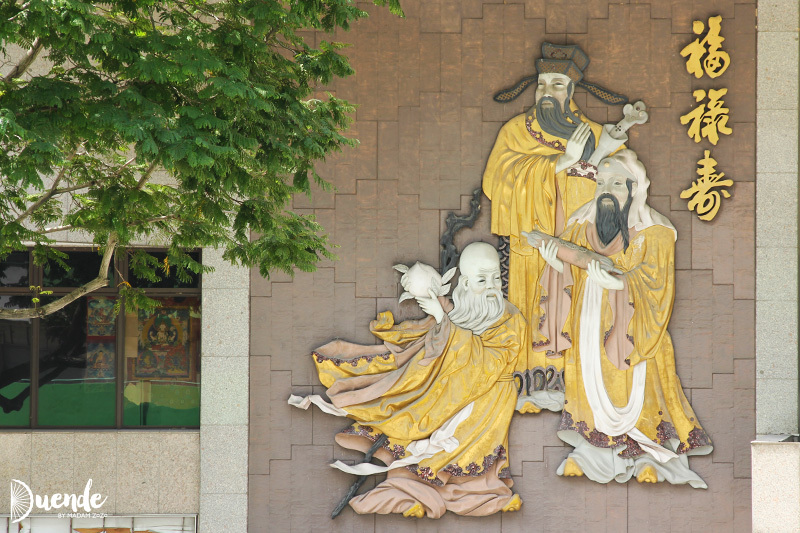 In Chinese culture, these three men are the human embodiment of important cultural values. 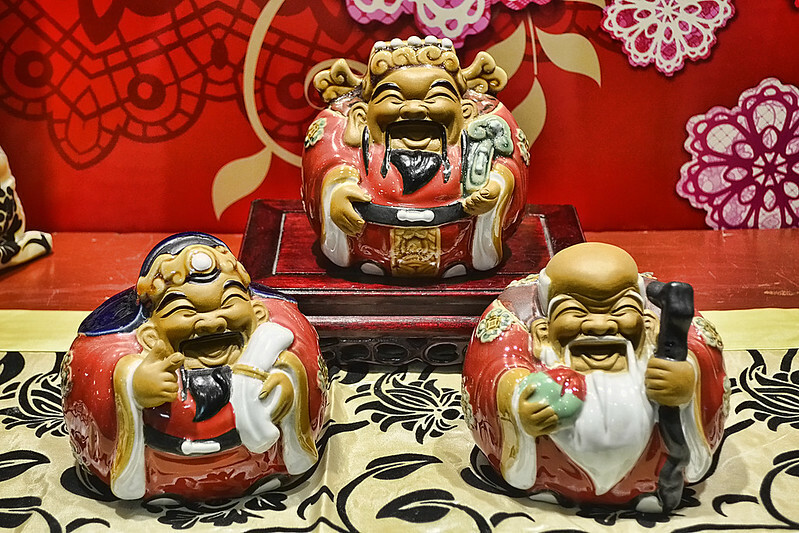 Known as the star gods Fu Xing, Lu Xing and Shou Xing, they stand for the highest priorities in a Chinese life: fortune (fú 福) and prosperity (lù 禄) and longevity (shòu 寿). Lu Xing is the first star of the Big Dipper constellation and god of prosperity, symbolising career success. He dresses as a Mandarin and prefers to accessorise with a scholarly scroll and, interestingly, a bouncing baby boy. In feudal China, employment in the civil service was highly regarded as it often meant an increase in income and social status. To be eligible for one of these highly coveted positions, people had to be educated in Confucianism and pass Imperial examinations. The word lu means “official’s salary,” and therefore Lu Xing became representative of literacy and success in these examinations, which still hold sway today. As for the baby boy Lu Xing is often found with? This can be explained by a more obtuse association of male children being another path to prosperity. Lu Xing is sometimes attributed with bestowing children upon fertility challenged couples. Finally, Shòu Xing is the star god of longevity and is most often found represented independently of his two co-star gods. It is said that Shòu Xing’s mother saw the Star of the South Pole the night he was conceived, so Shòu Xing is known as “The Old Deity of the South Pole.” In Chinese astronomy, this star is also thought to determine the time of a person’s death – hence Shòu Xing’s representation of longevity. In his human form, you can pick Shòu Xing out by his prominent forehead and the “Peach of Immortality” that he carries. He may also be propped up by a peachwood staff and followed by a deer, another symbol of longevity. The character for shòu (寿) is used extensively in Chinese decorative arts including window designs, tile mosaics, gates and embroidery, amongst many other forms. Fu Lu Shou statues should be positioned in a place of prominence and high energy, where they can bring unity and good fortune to all. They are said to perform better when placed on a high shelf, rather than a low surface – they are gods after all! In a home, the star gods are ideally placed in the dining room facing the dining table, to promote abundance. In the office, they should be displayed behind your desk or workspace. Businesses are recommended to place Fu Lu Shou where customer interaction takes place, such as a reception desk, or in a manager’s office. I wish you all the blessings, prosperity and longevity the star gods are willing to bestow. I hope you get that career break, bank account expansion, or family addition you are hoping for…and live to a ripe old age to enjoy it! For more Chinese culture and symbolism, click on over to Decoding Chinese New Year.